Practice in Christianity is the second volume in what could be called the “collected Works” of “Anti-Climacus,” Kierkegaard’s new pseudonym. Anti-Climacus’s first volume, The Sickness Unto Death, appeared just a year earlier in 1849. The use of a pseudonym is consistent with Kierkegaard’s usual practice when presenting an idealized statement of his subject, be it sexual seduction or Christian theology. Anti-Climacus argues the conceptual content of Christianity against the “leading thought of the times” and also against the ethical and social import of the comforts and consolations of bourgeois culture and religion which he called “Christendom.” In his own mind at least, Kierkegaards presents Christianity as it must be thought and lived if it is to be authentic. The Sickness unto Death and Practice in Christianity can be and are read quite independently, but jointly they provide the basis of Kierkegaard’s devastating critique of a secularized, culturally homogenized, and tame Christianity. 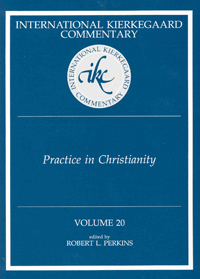 The authors of the studies in this present volume, Merold Westphal, Paul R. Sponheim, Murray A. Rae, Niels Jorgen Cappelorn, Sylvia Walsh, David D. Possen, Andrew J. Burgess, Christian Fink Tolstrup, Robert L. Perkins, and Wanda Warren Berry, raise a wide spectrum of issues regarding Practice in Christianity, its theology, its moral and religious psychology, and its cultural, social, and political world.